2. Kahakuloa Valley Tours take you from Nakalele Point which is home to Hawaii’s oldest lighthouse and its youngest lava flow, before you venture into the lovely Valley itself. 3. Some of the most amazing things to do in Maui are done in the water, and this guided scuba tour is no exception. Take a boat ride and partake in two dives, one could be exploring a shipwreck, one a coral reef, depending on the conditions. Refreshments are included as is information on reef ecology. 4. Things to do in Lahaina include taking a rainforest and waterfall tour. See the giant bamboo forests, the rain forest and all its amazing plants and trees, swim in a waterfall pool and enjoy both breakfast and lunch on this fully guided day trip to remember. 5. Helicopter tours are always very popular as you can see so much of the island’s majesty from the air. Several are available in all ports of call, making this the thing to do in Hawaii. 6. 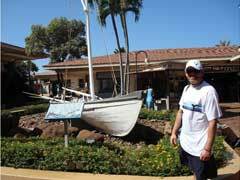 For a relaxing afternoon, take yourself on a walking tour of Lahaina town. Walk around the shops, enjoy the restaurants, take in the historical sights and marvel at the views. 7. Your Pride of America Cruise Hawaii will make Lahaina a port of call, and you can check out Kaanapali Beach, probably one of the best known and most popular destinations in Maui. Dive and snorkel right from the beach in this ocean playground. 8. Hike the Haleakala Crater on this incredible tour that allows you to go inside as far as you wish, or just sit and marvel at the sights. Breakfast is included as is a knowledgeable guide. 9. If hiking Haleakala doesn’t do it for you, how about biking down it? This tour offers two start times, 2am for the sunrise tour or 7:30 am for the mid-day tour. Bike downhill for 38 miles along the side of this dormant volcano. 10. Hike and Kayak together for one of the more exciting things to do in Lahaina, in one tour that starts on 27 acres of ranch land, and ends up cruising along in a kayak along the Maui coastline. Hawaii Island cruises offer you the best ports on all of the islands, and are a great way to see all of the stunning islands in one trip. Whether you partake in Cruises from Honolulu or come straight over from the U.S. mainland, you will never tire of the many wonderful things to do in Lahaina.